The Grumman S-2 Tracker (S2F prior to 1962) was the first purpose-built, single airframe anti-submarine warfare (ASW) aircraft to enter service with the United States Navy. Designed and initially built by Grumman, the Tracker was of conventional design — propeller-driven with twin radial engines, a high wing that could be folded for storage on aircraft carriers, and tricycle undercarriage. The type was exported to a number of navies around the world. Introduced in 1952, the Tracker and its E-1 Tracer derivative saw service in the U.S. Navy until the mid-1970s, and its C-1 Trader derivative until the mid-1980s, with a few aircraft remaining in service with other air arms into the 21st century. Argentina and Brazil are the last countries to still use the Tracker. The Tracker was intended as a replacement for the Grumman AF Guardian, which was the first purpose-built aircraft system for ASW, using two airframes for two versions, one with the detection gear, and the other with the weapon systems. The Tracker combined both functions in one aircraft. Grumman's design (model G-89) was for a large high-wing monoplane with twin Wright Cyclone R-1820 nine cylinder radial engines, a yoke type arrestor hook and a crew of four. Both the two prototypes XS2F-1 and 15 production aircraft, S2F-1 were ordered at the same time, on 30 June 1950. The first flight was conducted on 4 December 1952, and production aircraft entered service with VS-26, in February 1954. 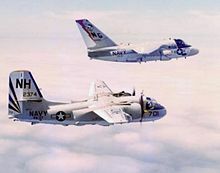 Follow-on versions included the WF Tracer and TF Trader, which became the Grumman E-1 Tracer and Grumman C-1 Trader in the tri-service designation standardization of 1962. The S-2 carried the nickname "Stoof" (S-two-F) throughout its military career; and the E-1 Tracer variant with the large overhead radome was colloquially called the "stoof with a roof.". Grumman produced 1,185 Trackers. At least 99 and possibly 100[note 1] aircraft carrying the CS2F designation were manufactured in Canada under license by de Havilland Canada. U.S.-built versions of the Tracker were sold to various nations, including Australia, Japan, Turkey and Taiwan. The Tracker carried an internal torpedo bay capable of carrying two lightweight torpedoes or one nuclear depth charge. There were six underwing hard points for rocket pods and conventional depth charges or up to four additional torpedoes. A ventrally-mounted retractable radome for AN/APS-38 radar and a Magnetic Anomaly Detector (MAD) AN/ASQ-8 mounted on an extendable rear mounted boom were also fitted. Early model Trackers had an Electronic Surveillance Measures (ESM) pod mounted dorsally just aft of the front seat overhead hatches and were also fitted with a smoke particle detector or "sniffer". Later S-2s had the sniffer removed and had the ESM antennae moved to four rounded extensions on the wingtips. A 70-million-candlepower searchlight was mounted on the starboard wing. The engine nacelles carried JEZEBEL sonobuoys in the rear (16 in early marks, 32 in the S-2E/G). Early Trackers also carried 60 explosive charges, dispensed ventrally from the rear of the fuselage and used for active sonar (JULIE) with the AN/AQA-3 and later AQA-4 detection sets, whereas the introduction of active sonobuoys (pingers) and AN/AQA-7 with the S-2G conversion saw these removed. Smoke dispensers were mounted on the port ventral surface of the nacelles in groups of three each. The Tracker was eventually superseded in U.S. military service by the Lockheed S-3 Viking; the last USN Tracker operational squadron (VS-37 with S-2G models) was disestablished in 1976. The last Navy S-2 was withdrawn from service on 29 August 1976. For many years the TS-2A version of the Tracker was used by U.S. Navy training units, culminating with its use by Training Squadron 28 (VT-28) for Student Naval Aviator training in the multi-engine pipeline with Training Air Wing FOUR (TRAWING 4) at Naval Air Station Corpus Christi, Texas. A number of Trackers live on as firefighting aircraft while the design also continued to provide excellent service with the naval forces of other countries for years after the U.S. retired them. For example, the Royal Australian Navy continued to use Trackers as front line ASW assets until the mid-1980s. Argentine S-2T Turbo Tracker in hangar with wings folded. The Argentine Naval Aviation received seven S-2As in 1962, six S-2Es in 1978 and three S-2Gs in the 1990s. They were used from both aircraft carriers, ARA Independencia and ARA Veinticinco de Mayo and used in the COD (US-2A conversions), Maritime Patrol and ASW roles. They were extensively used in the 1982 Falklands War, first from Veinticinco de Mayo, from where they detected the British Task Force and then from the mainland when the carrier returned to port after the sinking of the cruiser ARA General Belgrano. In the 1990s, six remaining airframes were refurbished by Israel Aerospace Industries with turboprop engines as S-2T Turbo Trackers. As of 2010, with the retirement of Argentina's only aircraft carrier, the Trackers are annually deployed on board Brazilian Navy aircraft carrier São Paulo during joint exercises ARAEX and TEMPEREX. [verification needed] and with U.S. Navy aircraft carriers during Gringo-Gaucho maneuvers. Between 1967 and 1984 the Royal Australian Navy operated two Squadrons of S-2E and S-2G variants, based at NAS Nowra (HMAS Albatross). These aircraft served with the RAN's 816 Squadron, which embarked aboard the Majestic-class aircraft carrier HMAS Melbourne as part of the 21st Carrier Air Group whenever that ship was deployed; and with 851 Squadron, the S-2 training squadron. During approximately 17 years of operation of the Tracker, the RAN lost only one S-2 during aircraft operations due to an accident at sea on 10 February 1975. However, on 4 December 1976, a deliberately lit fire in a hangar at Nowra destroyed or badly damaged a large proportion of the RAN's complement of Trackers. These were subsequently replaced with ex-USN aircraft. The replacement aircraft were all S-2Gs, including the original aircraft modified by the USN to that status. This saw the introduction of AQA-7 acoustic gear into RAN service and all RAN operational Trackers were subsequently modified to this standard. The Brazilian Air Force used Trackers. They operated from the aircraft carrier NAeL Minas Gerais. Both S-2A and S-2E were used (respectively as P-16A and P-16E) at the end of its service in Brazilian Air Force, one S-2T Turbo Tracker was used as a possible upgrade, but due the high costs it was canceled. However, in 2010 the Brazilian Navy contracted Marsh Aviation to convert four S-2T to Airborne Early Warning configuration, and upgrading four additional Grumman C-1 Trader for tanking and Carrier Onboard Delivery duties. The latter are scheduled to be back in service by 2015. They will operate from the successor of Minas Gerais, NAe São Paulo. As noted under Argentina above, Trackers of that country have been using São Paulo in the meantime. In 1954, de Havilland Canada entered into a contract to build Trackers under license to replace the outmoded Grumman TBM-3E Avengers being used by the Royal Canadian Navy. A total of 99[note 1] Trackers were built by de Havilland Canada, with the first Canadian-built aircraft flying on 31 May 1956. From 1957 onwards, these aircraft operated from the newly deployed aircraft carrier HMCS Bonaventure and various shore bases. All the Canadian Trackers were built to the earlier "A" model airframe design with a length of 42 feet (13 m) (c.f. 43 ft 6 in (13.26 m) for later model Trackers) in order to fit in Bonaventure's hangar. In 1960–1961, 17 CS2F-1 aircraft, which had been relegated to training and utility duties by the CS2F-2, were transferred to the Royal Netherlands Navy. From 1964, 45 CS2F-2s were upgraded by fitting revised electronic equipment and sensors, becoming CS2F-3s. Also in 1964, a pair of CS2F-1 aircraft were stripped of armament and ASW electronics, converted to transports, and subsequently used for carrier onboard delivery. The CS2F-1, -2, and -3 were redesignated as the CP-121 Mk.1, Mk. 2, and Mk. 3 respectively following the unification of Canadian forces in 1968. After Bonaventure was decommissioned in 1970, all remaining Canadian Trackers were transferred to shore bases. This limited their usefulness for ASW patrols, and between 1974 and 1981 gradually all but 20 were placed in storage and the remainder were stripped of their ASW gear. The remaining active-duty Trackers served until 1990 on fisheries protection and maritime patrol duties. A handful of Trackers were kept in flying condition until the late 1990s but were no longer used for active service. A single Grumman-built S2F-1 was sold to de Havilland Canada as a pattern and test aircraft; it was assigned RCN serial number 1500 and given X-500 wing markings. This aircraft may have been dismantled by DHC and reassembled as 1501 with the same wing markings, but some sources claim that 1500 was returned to the US Navy as BuNo 136519, and that 1501 was a new aircraft assembled by DHC from Grumman-provided parts, possibly with duplicate X-500 wing markings. 1501 was later upgraded to CS2F-1 standards and used as a stationary instructional airframe; it was placed in storage in 1972 and was undergoing restoration at the Shearwater Aviation Museum as of June 2015. The Japan Maritime Self-Defense Force received 60 S2F-1s in 1957 from U.S. stocks, and were operated until 1984. After being received, six S2F-1s were reconfigured into four S2F-U and two S2F-C variants. The S2F-1 was nicknamed Aotaka(あおたか, Blue Hawk). They were replaced by the Lockheed P-3 Orion. The Netherlands Naval Aviation Service (Marineluchtvaartdienst - MLD), the air arm of the Royal Netherlands Navy, received 28 S-2A (S2F-1) aircraft under MDAP from the US Navy in 1960. An additional 17 Canadian-built CS-2A (CS2F-1) aircraft formerly operated by the Royal Canadian Navy were delivered between December 1960 and September 1961 after being overhauled by Fairey Canada. These aircraft were operated from Valkenburg Naval Air Base as well as from the light aircraft carrier Karel Doorman until a fire in 1968 took that ship out of Dutch service. A total of 18 aircraft were converted to S-2N (for Netherlands) standard by Fairey Canada in 1968–1970 for ASW and MR use with 1 Sqn (at Hato International Airport), of which four were converted to US-2N trainer/transport standards in May 1971. Most of the de Havilland Canada-built CS-2As were scrapped by 1970 or used for ground instruction. The last Tracker in MLD service was withdrawn in January 1976, with some transferred to the Turkish Navy. The Peruvian Navy operated with S-2E and S-2G from 1975 until 1989, they were assigned to Naval Aviation Squadron N°12 (Escuadron Aeronaval N°12). A total of 12 S-2Es were bought from the U.S. Navy in 1975 and 4 S-2G in 1983. 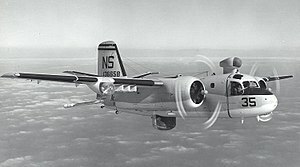 Grumman received a contract for the conversion of 32 S-2T Trackers (from 25 S-2Es and 7 S-2Gs) in service with the Republic of China Air Force in the late 1980s. Only 27 were ultimately converted due to a shortage of parts supplied by Grumman resulting in the use of remaining conversion kits as spare parts. 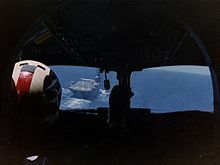 The 27 S-2Ts were transferred to the ROC Navy Aviation Command on 1 July 1999 and while the ROCN continues to operate the type, less than half of the fleet is in operational condition, will be replaced by 12 rebuilt P-3C from the U.S. Navy. On 2 July 2013, the rest of 11 S-2Ts were transferred back to ROC Air Force. The conversion involved: two Garrett/Honeywell TPE-331-15AW turboprop engines, each rated at 1,227 kW (1,645 shp), with four-blade propellers. The upgrade also included new mission equipment of AN/AQS-92F digital sonobuoy processor, A/NARR-84 99-channel sonobuoy receiver, Litton AN/APS-504 radar, AN/ASQ-504 MAD and AN/AAS-40 FLIR. The new turboprop engines resulted in a payload increase of 500 kg. Usually carries depth charges, Mk. 44, and Mk 46 lightweight ASW homing torpedoes. The Turkish Navy received a number of ex-U.S. Navy S-2E Trackers under the MAP program and operated them from the Cengiz Topel Naval Air Base starting in the 1960s. These were later supplemented by retired S-2A (or S-2N as called by the Dutch) airframes from Netherlands. Turkish Trackers were retired in 1994 after a series of accidents caused by the advanced age and fatigue of the airframes. The Uruguayan Navy received the first three S-2A Trackers on 10 April 1965 at the Capitan Curbelo Navy Base. On 15 September 1982, one S-2G arrived. On 2 February 1983, another two S-2Gs arrived. By September 2004, the remaining Uruguayan Trackers were not in flight condition. In the late 1980s and early 1990s Conair Aviation of Abbotsford, British Columbia, Canada took possession of retired U.S. and Canadian Trackers and converted them into Firecats, with a fire retardant tank replacing the torpedo bay. The Firecats were made in two variants, a piston engine Firecat and a turboprop-powered Turbo Firecat. In 1958, CAL FIRE, then CDF, contracted with a private air tanker service for the use of their converted World War II aircraft. By 1970 the department began to evaluate the use of former military Grumman S-2 aircraft. Over the next ten years CAL FIRE continued to build up its fleet of S-2A air tankers and in 1987, CAL FIRE began the process of converting their piston engines to turboprop. By 2005 all of CAL FIRE's airtanker fleet had been converted to S-2T air tankers. Two prototype anti-submarine warfare aircraft powered by 1,450 hp R-1820-76WA engines. Designation of the first 15 production aircraft used for development, redesignated YS-2A in 1962. Initial production variant with two 1,525 hp R-1820-82WA engines, re-designated S-2A in 1962, 740 built. Trainer conversion of S2F-1, redesignated TS-2A in 1962. 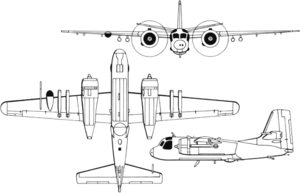 Utility conversion of S2F-1, redesignated US-2A in 1962. S2F-1 conversion with Julie/Jezebel detection equipment, redesignated S-2B in 1962. Survivors converted to US-2B after removal of ASW gear. S2F-1S fitted with updated Julie/Jezebel equipment, redesignated S-2F in 1962. As S2F-1 with asymmetrical (port-side) extension of bomb bay, slightly enlarged tail surfaces, 77 built, most redesignated S-2C in 1962. Photo reconnaissance conversion of S2F-2, redesignated RS-2C in 1962. Utility conversion of S2F-2/S-2C, redesignated US-2C in 1962. Some were used as target tugs. Enlarged forward fuselage, enlarged tail surfaces, additional fuel capacity, and enlarged engine nacelles bays for 32 sonobouoys, redesignated S-2D in 1962, 100 built. As S2F-3 but with Julie/Jezebel equipment, redesignated S-2E in 1962, 252 built. S2F-1T training version redesignated in 1962 and 207 conversion from S-2A. S-2A converted as light transports/target tugs, 51 conversions. Utility and target tug conversions of S-2A and S-2B; most S-2Bs were converted and 66 S-2As. S2F-2P photo-reconnaissance version redesignated in 1962. S2F-2U utility version redesignated in 1962. Proposed self-contained night attack aircraft to be developed under Operation Shed Light; none produced. Electronic trainer conversion of the S-2D. Utility conversion of the S-2D. Initial production run of anti-submarine warfare aircraft for Canada based on S2F-1. A total of 42 built by De Havilland Canada. Improved version of CS2F-1 with Litton Industries tactical navigation equipment. A total of 57 were built by De Havilland Canada. New designation given to 43 CS2F-2 aircraft upgraded with additional electronics. New designation given to all CS2F-1, -2, and -3 aircraft following unification of Canadian military in 1968. 6 upgraded S-2E turboprop engines conversion by IAI in the 1990s for the Argentine Navy. 27 out of 32 upgraded S-2E and S-2G turboprop engines conversion by Northrop Grumman in the 1990s for then Taiwan/ROC Air Force, now operates by Taiwan/ROC Navy aviation. Civil firefighter conversion with turboprop engines. CDF S-2F3AT Turbine Tracker landing at Fox Field, Lancaster, California, while fighting the North Fire in 2007. Turboprop conversion, powered by two Garrett TPE331 engines; A total of 22 are operated by the CDF. Civil conversion as a single-seat firefighting aircraft. Republic of China Navy currently has 26 S-2T (upgraded S-2E/S-2G), not all operational, to be replaced by 12 rebuilt U.S. Navy P-3C Orions). United States Navy operated Trackers between 1954 and 1976. United States Marine Corps operated some Trackers. Many retired Trackers were sold to private owners for fire-fighting duties. Some were rebuilt and re-engined with turboprop engines. Conair Group Inc. received TS-2A/Conair Firecat (G-89). Saskatchewan Environment received TS-2A/Conair Firecat (G-89). Sécurité Civile received U.S.-2A/Conair Turbo Firecat (G-89). KLM used ex-Dutch Navy Tracker to train its mechanics. Aero Union, in addition to being an operator, Aero Union developed the prototype S-2 tankers for the State of California in 1973. Although still in active service in South America, numbers of Trackers are on public display, mainly in countries that formerly operated the type. ^ a b c 101 Royal Canadian Navy CS2F serial numbers (1500—1600) were assigned, but it is unclear whether 1501 was an all-new test aircraft or was a new serial number given to Grumman-built S2F-1 1500 after it was dismantled and reassembled. If RCN 1500 and 1501 were different aircraft, Canadian production was 100 and total production was 1,285. ^ a b Walker, R.W.R. "Royal Canadian Navy – CS2F Tracker detailed list - part 1". Canadian Military Aircraft Serial Numbers. Retrieved 30 June 2015. ^ O'Rourke, G.G., Captain USN. "Of Hosenoses, Stoofs, and Lefthanded Spads". United States Naval Institute Proceedings, July 1968. ^ "Grumman S-2 Tracker". s2tracker.com. Retrieved 19 January 2016. ^ "Grumman C-1 Trader / S-2 Tracker". Warbird Alley. 4 December 1952. Retrieved 26 July 2013. ^ "Tracker History". S2ftracker.com. 4 December 1952. Archived from the original on 19 October 2013. Retrieved 26 July 2013. ^ "The Seventies." history.navy.mil. Retrieved: 15 June 2010. ^ Jackson, David D. "Grumman S2F / S-2 Trackers in service with the Argentina Navy." Archived 19 October 2013 at the Wayback Machine Surviving Grumman S2F Tracker Information Repository, 2010. Retrieved: 15 June 2010. ^ "Escuadrilla Aeronaval Antisubmarina." (in Spanish) Archived 14 August 2009 at the Wayback Machine institutoaeronaval.org. Retrieved: 15 June 2010. ^ "Pictorial and historical data (in Spanish)." histarmar.com.ar. Retrieved: 15 June 2010. ^ "S-2 video." youtube.com. Retrieved: 15 June 2010. ^ a b c d e f Gillett 1987, p. 206. ^ Francillon 1989, p. 367. ^ Cummings 1988, pp. 180–182. ^ "de Haviland Grumman CP-121 Tracker." Archived 5 December 2010 at the Wayback Machine airforce.forces.gc.ca. Retrieved: 19 November 2012. ^ Cummings 1988, p. 182. ^ a b c "Grumman Tracker." Shearwater Aviation Museum. Retrieved: 27 March 2008. ^ a b Tate, Colonel D.H. "Grumman CS2F / CP-121 Tracker." Canada Aviation and Space Museum. Retrieved: 22 March 2009. ^ a b "Grumman CS2F/CP 121 Tracker". Shearwater Aviation Museum. Retrieved 28 May 2015. ^ a b "Netherlands Naval Aviation Service". Aeroflight.co.uk. Retrieved 26 July 2013. ^ "Netherlands Naval Aviation Service". Aeroflight.co.uk. Retrieved 26 July 2013. ^ "KDoorman". Steelnavy.com. Retrieved 26 July 2013. ^ "Northrop Grumman S-2T Turbo Tracker." taiwanairpower.org, 19 October 2008. Retrieved: 22 September 2010. ^ Jackson, David D. "Uruguay Museum or Outside Display S2F / S-2 Grumman Trackers." Archived 29 October 2010 at the Wayback Machine Surviving Grumman S2F Tracker Information Repository, 2010. Retrieved: 23 August 2010. ^ "Firefighting Aircraft Recognition Guide." 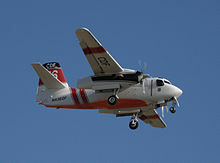 Firefighting Aircraft (n.d.): 1. http://calfire.ca.gov/communications/downloads/fact_sheets/Aviation_Firefighting_webbooklet.pdf. Cal. Fire. Web. 8 Oct. 2014. ^ "Marsh S-2F3AT Turbo Tracker." FAA registry entry showing manufacturer, model and engine type. Retrieved: 15 June 2010. ^ "Argentina S2F Trackers". S2ftracker.com. Archived from the original on 19 October 2013. Retrieved 7 January 2014. ^ a b Jerry Proc. "Radio Research Paper - Tracker In Canadian Service". Jproc.ca. Retrieved 7 January 2014. ^ "Italian Air Force Aircraft Types". aeroflight.co.uk. Retrieved 19 January 2016. ^ "Grumman CS2F Tracker." Archived 1 October 2011 at the Wayback Machine Canadian Bushplane Heritage Centre, 2011. Retrieved: 10 July 2011. ^ "P2V Neptune." p2vneptune.com. Retrieved: 15 June 2010. Cummings, Bill. "Thirty Years and Still Counting: Grumman Trackers in Canadian Service". Air International, Vol. 34, No. 4, April 1988. pp. 180–188. Francillon, René J. Grumman Aircraft since 1929. London: Putnam Aeronautical Books, 1989. ISBN 0-85177-835-6. Gillett, Ross. Australia's Military Aircraft. Sydney, Australia: Aerospace Publications Pty Ltd, 1987. ISBN 0-7316-0363-X. Hotson, Fred W. The de Havilland Canada Story. Toronto, Ontario, Canada: CANAV Books, 1983. ISBN 0-07-549483-3. Sullivan, Jim. S2F Tracker in Action Aircraft number 100, Carrolton, TX: Squadron/Signal Publications, 1990. ISBN 0-89747-242-X. Taylor, Michael, ed. Encyclopedia of Modern Military Aircraft. New York: Gallery Books, 1987. ISBN 0-8317-2808-6. Núñez Padin, Jorge Felix. Núñez Padin, Jorge Felix (ed.). S-2 Tracker & Turbo Tracker. Serie Aeronaval (in Spanish). 26. Bahía Blanca, Argentina: Fuerzas Aeronavales. Archived from the original on 28 May 2015. Retrieved 10 September 2014. Wikimedia Commons has media related to Grumman S-2 Tracker.